Fairline Boats, a British Luxury motor yacht manufacturer has launched its all-new Squadron 50 flybridge motor yacht. With a cleverly designed interior layout arrangement, the three cabin, two en-suite Squadron 50 flybridge motor yacht provides an unsurpassed amount of living space in its class. 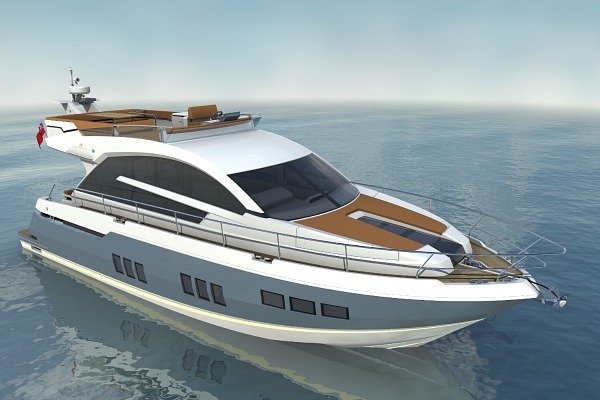 Owners of the Squadron 50 will have a master cabin the size that would normally be expected on a yacht of 60ft plus. Panoramic hull windows and overhead glazing add natural light into the cabin, further contributing to the feeling of spaciousness. The two additional twin cabins comprise two beds which can be converted to doubles. An optional fourth-crew cabin with feature window is also available and is easily accessed from the cockpit, even when underway. Fairline’s design trend towards spacious and light-filled living areas continues into the large saloon with its huge panoramic windows, available with optional powered opening section. A first on a Fairline motor yacht, the galley is positioned aft in the saloon, allowing easy access for al fresco dining in the sociable cockpit area. The glass patio door features an optional opening window ideal for serving guests in the cockpit. The class-leading flybridge is larger than previously seen on a boat of this size, providing plentiful areas for entertaining and relaxing, and the upper helm position has been located portside to enable an even clearer view of the rear platform when mooring. Other key features of the Squadron 50 include the innovative, patent-pending optional Fairline Tender Launch System at the stern platform for personal watercraft up to the size and weight of a Williams 285 Jet RIB. This revolutionary system will assist owners in launching and retrieving their boat in and out of the water. See www.fairline.com for further details about Fairline’s latest models, the many shows and events the company attends worldwide, and contact details of the authorised Fairline dealer network.